About 20 years ago, one of the biggest fad diets for people trying to lose weight was the Atkins Diet. Essentially, this was a ketogenic diet in which you would consume 70-75% of your total caloric intake from fats, 15-20% protein and 5% carbs. Dr. Robert Atkins did not come up with the ketogenic diet, he merely marketed it (very successfully) to the masses claiming that bacon and butter were back. For the most part, people did lose a lot of weight. However, because of the discipline, it takes to follow such a carb-restrictive diet, many people often gained a lot of the weight back. Fast forward to our current state of understanding how ketogenic diets work and its implication for weight loss, exercise performance, and even medicinal interventions. The new "fad" in our industry are these exogenous ketone salts. There seem to be products popping up left and right, including ketone salts that make claims such as, instant state of ketosis. Is there any truth to these claims? My goal here is to explain all the current science we have on ketone salts and dispel any rumors floating around how they actually work as a dietary supplement. First off, what are ketones? Ketone bodies are the products of fatty acid metabolism in the mitochondria of your liver. There are three ketone bodies your body naturally produces: Acetoacetate (the most abundant), (R)-beta-hydroxybutyrate (BHB), and to a lesser extent acetone (acetone is normally what you smell on a person's breath if they are in ketosis). When glucose is scarce, your body can go into a state of ketosis, where it will shift to producing and using ketones as its primary source of fuel in your heart, brain and muscle tissue. Just like glucose, ketone bodies can be used as a source of energy for your body, as their breakdown yields 22 ATP and 2 GTP molecules per molecule of acetoacetate. Ketone production is upregulated during periods of starvation which may have been an evolutionary survival mechanism to act as a fuel source for your brain. Ketones also serve many important physiological functions. Ketone bodies offer a range of positive metabolic effects including lowering glucose utilization, protein-sparing properties (possibly due to their abilities to act as a Histone Deacetylase inhibitor which can decrease myostatin levels) and exhibit anti-lipolytic actions on adipose tissue. Enhanced brain function is another reason why a "keto" diet has been whisked back into popularity. Studies show that your brain can run almost 25% more efficiently when using ketones as fuel vs glucose. Studies also state that elevated blood ketone levels can improve memory function, as well as increase ATP concentrations and the number of hippocampal mitochondria in the brain of mice by up to 50%. Performance enhancement is can be the result of reconfiguring your body to run on ketones instead of glucose. Part of the theory for that has to do with the fact that ketones like BHB can provide greater enthalpy (heat of combustion, energy for Krebs cycle) per 2c carbon units vs pyruvate, the end product of glycolysis. In fact, ketones are readily oxidized in skeletal muscle tissue, which causes a glucose sparing effect. While there have been mixed reviews on improving exercise performance while following a ketogenic diet, this article will focus solely on the latest research regarding exogenous ketone supplements and their effect on performance. Exogenous ketone salts were first investigated in the 1960s as a treatment for epilepsy (which it still is used for) as a way to rapidly increase circulating plasma ketone levels. Supraphysiological levels of blood ketones are known as hyperketonemia and can have many health benefits, but it usually only occurs after being in a state of starvation. To achieve a state of ketosis, blood ketone levels much reach 0.5-3.0mM, which can take days if just starting a ketogenic diet. In one of the first studies on newer exogenous ketone supplements in 2016, rats were given BHB, MCT, BHB and MCT, and a novel ketone diester for 28 days. All groups experienced "nutritional ketosis" (exogenous ketone induced ketosis), with the MCT group peaking the quickest and BHB and MCT group showing the highest millimolar (mM) concentration (Note- MCT convert to BHB and Acetoacetate once they are metabolized in the body). An interesting side note of this study is that all groups showed little to no change in triglycerides and lipoproteins, which are often concerns for people following a ketogenic diet. it's theorized that a ketogenic diet can actually lower blood triglycerides and LDL, as well as increase HDL, which was the case with me when I follow a ketogenic diet. So, we know that they can induce nutritional ketosis. Ketone bodies, both exogenous and endogenous, have been shown to be glucose-sparing by offering an alternate fuel source in muscle tissue for energy. A 2015 study investigated this very mechanism in highly-trained male athletes who were given a ketone ester and dextrose or just dextrose drink. After 30 minutes, subjects performed 2 hours of 70% intensity bicycle exercise, after which blood levels of BHB, insulin, lactate, glucose, intramuscular triacylglycerol (IMTAG), cortisol and free fatty acid were measured. As expected, BHB levels rose to 2.2mM (hitting nutritional ketosis) before exercise and topped off at 3.2mM after. One intriguing possible use for exogenous ketones is their use for glycogen replenishment post-workout. 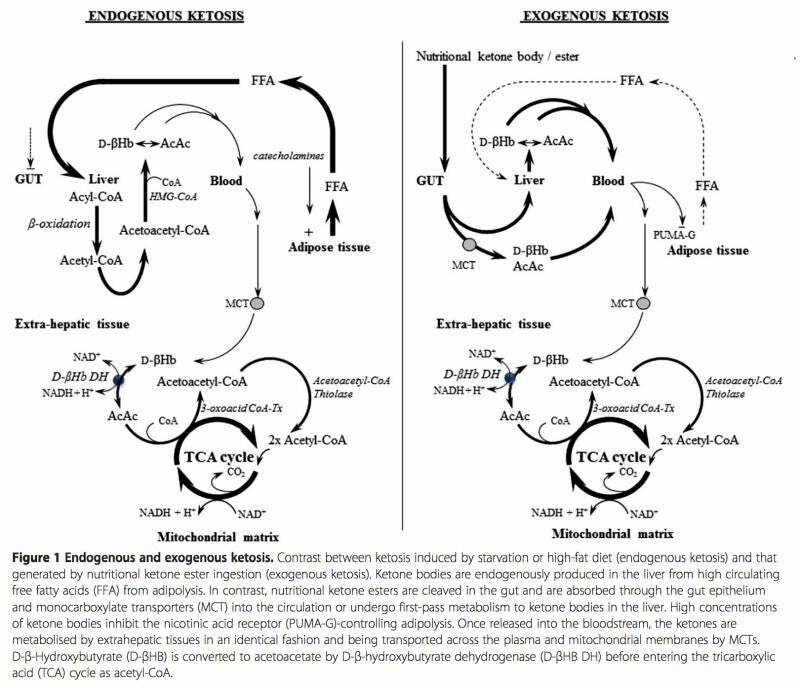 Since ketone bodies are known to inhibit glycolysis, most like via inhibiting the enzymes pyruvate dehydrogenase and phosphofructokinase, in theory, co-ingestion of exogenous ketones and carbs may help increase muscle glycogen replenishment. A preliminary (bada**) study involving 12 well-trained British Forces servicemen who received an intravenous carbohydrate treatment with or without ingestion of a ketone drink, post glycogen draining exercise. The group receiving the ketone drink and carbs demonstrated a 33% increase in whole-body glucose disposal, as well as a 50% increase in muscle glycogen levels post exercise. As far as a cognitive enhancement, I haven't seen a study that is used in healthy human subjects. There are, however studies in patients with Alzheimer's disease showing improvement in memory and cognitive function. Extreme Physiology & Medicine 3.1 (2014): 17. First off, I follow a ketogenic diet normally 8-10 months out of the year and consider myself keto-adapted. I have used BHB salts, ketone esters, and powdered MCTs for not just training, but for overall health and cognitive purposes, as well. I definitely notice the cognitive effect when I ingest 10-15g of BHB salts, which is increased when I add MCT powder. The cognitive effect is great for training, especially when you want to ease off the caffeine and other stimulants. The research suggests that MCTs actually elevate blood ketone levels greater than BHB does, so I normally combine the two. This combination usually gets my blood ketone levels to around 2mM. If I take them pre-workout, I always have a ton of energy at the gym and can train longer without getting exhausted. I have tried the ketone ester (which is a liquid) on a few occasions, but it's so expensive and you need to talk a lot of it that it's not a viable option as a supplement. I have not tried BHB with carbs before, though. That is something I am interested in trying after seeing the research about glycogen replenishment. The bottom line is that there isn't a lot of research yet on exogenous ketones and exercise performance. We know they put you into "nutritional ketosis", which is NOT THE SAME as being in ketosis from diet/starvation. I'm very eager to see more studies on BHB salts and their effect on inflammation. Some of the current research for epilepsy and Parkinson's/Alzheimer's disease is truly fascinating, not to mention the research going on for cancer treatment. Bottom line, exogenous ketones are an exciting new supplement that has many applications in the health and fitness industry. More research needs to be conducted to see if some of the benefits of being in ketosis transfer over into taking exogenous ketones. 1) Balasse, Edmond O., and Françoise Féry. 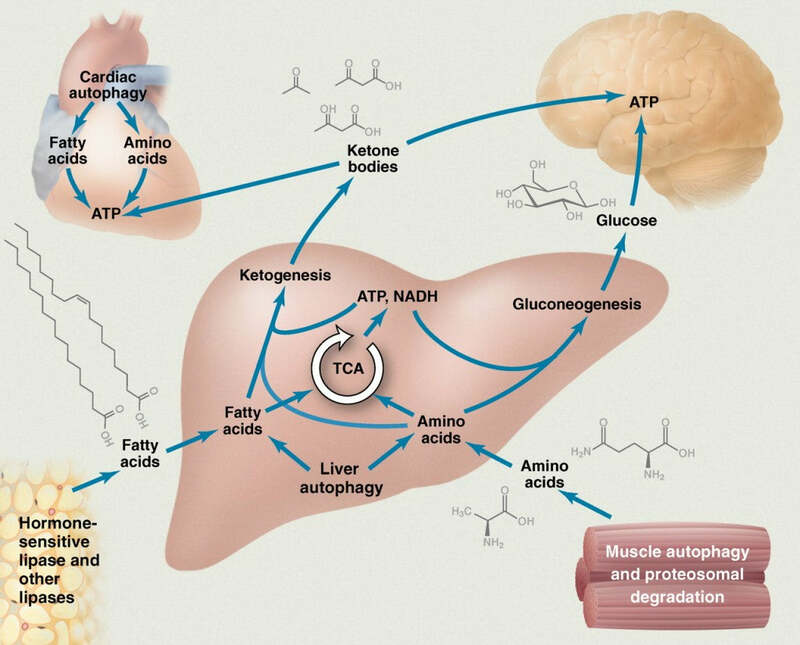 "Ketone body production and disposal: effects of fasting, diabetes, and exercise." Diabetes/Metabolism Research and Reviews 5.3 (1989): 247-270. 2) Newman JC, Verdin E. Ketone bodies as signaling metabolites. Trends Endocrinol Metab. 2014;25(1):4252. 3) Paoli, Antonio. "Ketogenic diet for obesity: friend or foe?." International journal of environmental research and public health 11.2 (2014): 2092-2107. 4) Krikorian, Robert, et al. "Dietary ketosis enhances memory in mild cognitive impairment." Neurobiology of Aging 33.2 (2012): 425-e19. 5) Xu, Kui, et al. "Diet-induced ketosis improves cognitive performance in aged rats." Oxygen Transport to Tissue XXXI. Springer, Boston, MA, 2010. 71-75. 6) Ruskin, David N., Masahito Kawamura Jr, and Susan A. Masino. "Reduced pain and inflammation in juvenile and adult rats fed a ketogenic diet." PLoS One 4.12 (2009): e8349. 7) Lambert, Estelle V., et al. "Enhanced endurance in trained cyclists during moderate intensity exercise following 2 weeks adaptation to a high-fat diet." European journal of applied physiology and occupational physiology 69.4 (1994): 287-293. 8) Kesl, Shannon L., et al. "Effects of exogenous ketone supplementation on blood ketone, glucose, triglyceride, and lipoprotein levels in Sprague-Dawley rats." Nutrition & Metabolism 13.1 (2016): 9. 10) Holdsworth, D. A., P. J. Cox, and K. Clarke. "Oral ketone body supplementation accelerates and enhances glycogen synthesis in human skeletal muscle following exhaustive exercise." J Clin Lab Invest 19.3 (1967): 218-28. 11) Reger, Mark A., et al. "Effects of -hydroxybutyrate on cognition in memory-impaired adults." Neurobiology of Aging 25.3 (2004): 311-314. 12) Costantini, Lauren C., et al. "Hypometabolism as a therapeutic target in Alzheimer's disease." BMC Neuroscience 9.2 (2008): S16. Previous article Theacrine: A Better Stimulant Choice Than Caffeine? Haven’t tried these yet, but very intriguing.